Anyone who has suffered a serious injury knows how debilitating and heartbreaking it can be. But what if that injury left you paralyzed? Suddenly you're unable to do all the things you used to - walk, run, or play. That’s what happened to JJ, a one and a half-year-old pit bull mix from New York. JJ was brought in to Shirley Veterinary Hospital in Shirley, NY by his owners who said he became paralyzed while playing outside one day. It turns out JJ suffered a spinal cord stroke known as FCE or fibrocartilaginous embolism. Unfortunately, JJ’s owners were unable to afford the medical care necessary and requested JJ be euthanized. The veterinarians took one look in JJ’s eyes and couldn’t do it. Dogs who are diagnosed with FCE are known to make recoveries with therapy and rehab but JJ would need an MRI to confirm whether he could ever walk again. While at the vet, JJ received physical therapy by his veterinarian, Dr. Archer. He was also given a wheelchair to help him get around easier. At just one and half years old, JJ is full of life, has an exuberant personality, and gets along with everyone he meets – dogs and cats included. 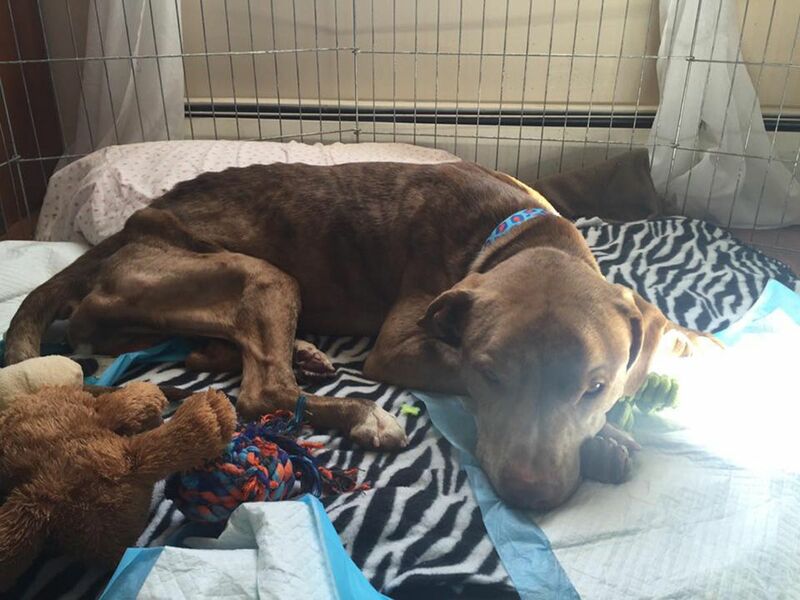 The vets so desperately wanted to find him a loving home, so they shared his story on the Desperate Dogs of Long Island Facebook page. ADOPTED! *HE SUFFERED A STROKE- AND HE DESPERATELY NEEDS A HOME..... SUFFOLK COUNTY LONG ISLAND NY- CONTACT 631-281-8820, or email shirleyvethosp@optonline.net JJ, 1 and a half year young male staffie mix, weighing in at 45lbs Brought in by his owner as ''down on his hind end,'' his owner requested he be euthanized- and the vet couldn't do it. He has been diagnosed by Dr Archer as having FCE (fibrocartilaginous embolism) a spinal cord stroke. Often dogs diagnosed with FCE can make full recoveries with therapy and rehab, He has been receiving physical therapy by Dr Archer and has recently received a cart, however his back legs are atrophied. JJ is a dog with a fabulous personality, he loves everyone he meets, and he can't wait to kiss you- as soon as he meets you. He can often be found sleeping with his kitty friends, and he is fantastic with other dogs. Yes- he's that perfect. JJ writes: "Some day, that door is going to ring for me. The car rides I love so much will mean I am going home. That man or woman will wrap me up in their arms and love me. I will cherish them and give them so many kisses back. I may never walk again, only an MRI will confirm that. But I can still roll into your heart. I am going to keep fighting to walk. Please keep fighting to help me find a home. I can not do that on my own. " He's been at the vet's office for close to a year, and that's a year too long....please share his story widely- and let's help JJ.....find his miracle. *Please note- JJ has a wheelchair. Then one day, everything changed for JJ – someone was interested in adopting him! Krystle Kincaid, a volunteer at SNARR Animal Rescue, contacted Desperate Dogs of Long Island regarding JJ. It was a match made in heaven. Kincaid has dedicated her life to helping dogs with special needs and immediately knew JJ would fit in perfectly with her family. Now, JJ spends his days with Kincaid and the rest of pack. He does weekly water therapy and is already making progress – he has gained more 20 pounds and looks like a brand new dog. Kincaid hopes JJ will learn to walk again someday but even if he doesn’t, she still love him just as much. Although JJ suffered a terrible injury that left him paralyzed, he always remained a hopeful, cheerful pup. And the best part? He found someone who loves him regardless of how he looks. Now, he’ll spend the rest of his days filled with nothing but love, happiness, and lots of kisses! Also, be sure to follow JJ's progress on his Facebook page!